Show Recap – Couples in Business Talk and Award Winning Toffee to Go! Working Women Wednesdays featured today on #ThatBusinessShow. 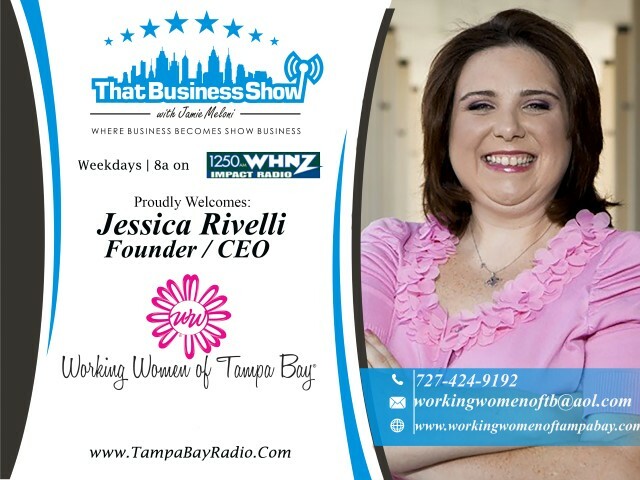 This weekly segment is sponsored by the Working Women of Tampa Bay Networking Group and visit http://www.workingwomenoftampabay.com for all their great events. Also check out http://www.workingwomenconference.com for tickets to the upcoming State Conference and use promo code Meloni2015 for 10% off tickets. The event being held September 10th and 11th at the Straz Center in Tampa is an amazing event with many vendors and attendees and is a must attend event for anyone in business! 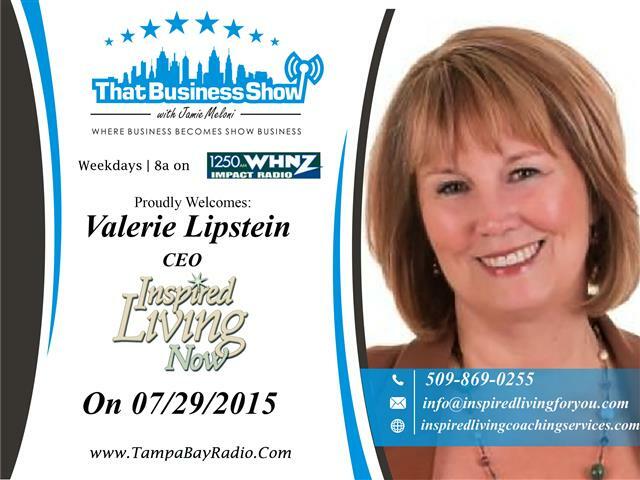 My 2nd guest was Valerie Lipstein, CEO of Inspired Living Now and a life coach specializing in couples in business. Valerie has been working as a coach since 2007 and specializing in this area since 2010 and has a passion for assisting couples in business due to her own challenges she and her husband Michael experienced in their joint business. Today, Michael is her “secret weapon” in business and also specializes in relationship consulting and together they have helped countless couples success in business and their relationships combined. Her company offers an assessment to gauge the problem areas of the relationship and then works with couples through group coaching, workshops and retreats. Valerie shares some of her viewpoints on this area in this opening segment and touches on how work / life balance is more about having flexible boundaries with regards to couples in a business. Its important to schedule regular date nights and avoid the business talk on the dates to have separation in the relationship too. Valerie also talks on the subject of employee disengagement and how that applies to small family businesses with employees and some of the solutions therein on this segment. Valerie is a frequent speaker on this topic too and will be speaking at the event on August 6th noted prior and learn more about her and her services at http://inspiredlivingcoachingservices.com and reach out to her at 509-869-0255 or email at info@inspiredlivingforyou.com for help with your business! 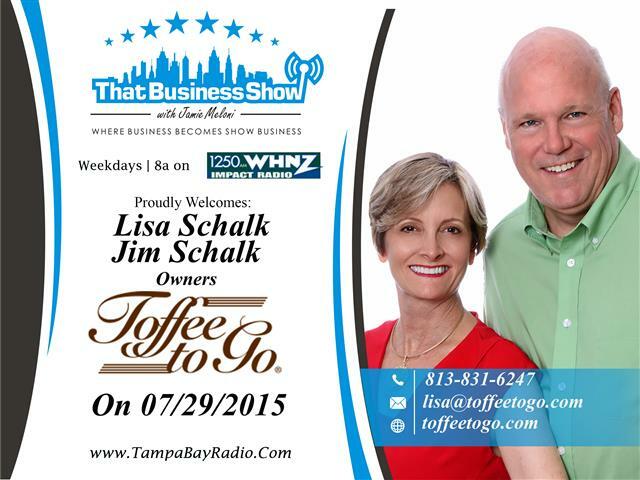 On the 2nd half of the show, I welcomed Lisa and Jim Schalk, Owners of Toffee to Go. In business together for nearly 20 years, this husband and wife team has grown this business literally out of their home. Starting out as a simple family recipe to share with friends on the holidays, people began asking how they could get more and the business grew up from there. Today, they have a warehouse and many employees making 3 different flavors of this award winning toffee. Lisa shares the story of how Oprah Winfrey picked their toffee as one of Oprah’s Favorite Things in 2013 and that endorsement sent their business skyrocketing. Lisa had for years talked about getting the product into the Oprah Magazine and onto her list and that became a reality after she sent samples of the toffee to the Magazine and she ran into one of the producers of the Magazine who remembered her and her product. She asked that he get it in front of Oprah personally and he did and that led to the endorsement. Lisa and Jim also share some of their growing pains as a couple in business on this segment and they too will be featured as speakers at the upcoming event on August 6th, Marriage and Business : The Ultimate Balancing Act. This is another great segment with some great stories and tips on couples working together in business and as always you can catch the show On Demand at http://www.tampabayradio.com and the video is also up on my YouTube channel located here https://www.youtube.com/user/jamiemeloni Check out http://www.toffeetogo.com for more information on the product and its delicious, I had some in studio today with them and reach out to them at 813-831-6247 or email at lisa@toffeetogo.com for more information! This entry was posted in Entrepreneurship and Business and tagged branding, business, couples in business, entrepreneur, foreclosures, real estate, toffee, working women of tampa bay. Bookmark the permalink.